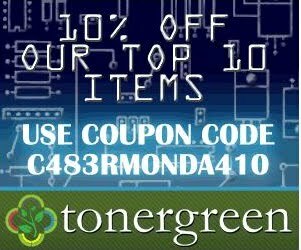 Cyber Monday Sale: 10% Off on Top 10 TonerGreen Items Plus Free Shipping | TonerGreen - Eco-Friendly Toners from the U.S. It's Cyber Monday and TonerGreen.com has a lot of great offers just for you. Why not shop now and get an instant 10% off on its top 10 items plus free shipping too? Sound good? Check out the entire list of remanufactured laser toner cartridges that are up for grabs on this one-day grand sale. Yes! It's Cyber Monday today, the busiest day for all online stores and all shoppers are just so excited to get freebies and discounts from all sorts of products. Since TonerGreen.com would also like to share the fun with its customers, we are giving a 10% discount on our top 10 remanufactured laser toner cartridges plus you get free shipping too! Here are the items that you might want to purchase on this day for more savings. All you have to do is type the coupon code: C483RMONDA410 on the Coupon Box found at your Checkout page and you'll automatically receive the discount and free shipping. This is just a one-day offer so be sure to place those orders on November 29,2010. So what are you waiting for? Shop now at TonerGreen.com and get more savings while enjoying the best prints from its wide range of remanufactured laser toner cartridges and ink cartridges.